Despite the improvements in increasing popularity of endovascular therapy for intracranial aneurysms, there remain a large number of these lesions that currently are not amenable to endovascular therapy. As endovascular therapy becomes more popular, those aneurysms requiring surgical intervention will become increasingly complex. To manage these challenging lesions, neurosurgeons must use all available innovations and advances, including diagnostic, technical and perioperative adjuncts. In this review article, we discuss limitations of endovascular therapy, the populations of aneurysms that continue to require surgical treatment, the factors that make an aneurysm complex and the multiple adjuncts utilized to successfully treat these challenging lesions. Anesthetic management of intracranial arteriovenous malformation (AVM) poses multiple challenges to the anesthesiologist in view of its complex and poorly understood pathophysiology and multiple modalities for its treatment involving different sub-specialties. The diagnosis of AVM is based on clinical presentation as well as radiological investigation. Pregnant patients with intracranial AVM and neonates with vein of Galen malformation may also pose a special challenge and require close attention. Despite technological advancement, reported morbidity or mortality after AVM treatment remains high and largely depends on age of the patient, recruitment of perforating vessels, its size, location in the brain, history of previous bleed and post-treatment hyperemic complication. Anesthetic management includes a thorough preoperative visit with meticulous planning based on different modalities of treatment including anesthesia for radiological investigation. Proper attention should be directed while transporting the patient for the procedure. Protection of the airway, adequate monitoring, and maintaining neurological and cardiovascular stability, and the patient's immobility during the radiological procedures, appreciation and management of various complications that can occur during and after the procedure and meticulous ICU management is essential. BACKGROUND: Ten randomly selected adult cadaveric specimens were dissected to analyse the anatomy of the vertebral artery during its course from the C3 transverse process to its entry into the spinal dural canal at the level of C1. In addition, 10 dry cadaveric C1-C2 bones were studied. The course of the artery and the parameters relevant during surgery in the region are evaluated. METHODS: Ten adult cadaveric specimens and 10 adult dry cadaveric C1 and C2 bones were studied. In five cadaveric specimens, the arteries and veins were injected with coloured silicon. The artery during its course from the transverse process of C3 to the transverse process of C2 was labelled as V1 segment, the artery during its course from the C2 transverse process to the C1 transverse process was labelled as V2 segment and the segment of the artery after its exit from the transverse foramen of C1 to the point of its dural entry was labelled as V3 segment. The relationship of the artery to the C1-2 joint and facets, distance of the location of the artery from the midline, from the C2 ganglion and from the other surgery related landmarks were evaluated. The extent of occupancy of the artery into the vertebral artery groove on the inferior surface of the superior facet of the C2 vertebra, and over the posterior arch of the atlas was studied. RESULTS: The V1 segment of the vertebral artery takes a varying degree of loop inside the vertebral artery foramen on the inferior aspect of the superior facet of the C2 vertebra. The loop extends towards the midline and was at an average distance of 14.6 mm from the midline of the vertebral body. The V2 segment of the artery takes an initial lateral loop after its exit from the transverse process of the C2 vertebra. The average distance of the artery from the lateral end of the C2 ganglion was 7.2 mm and from the dural tube was 15.3 mm. 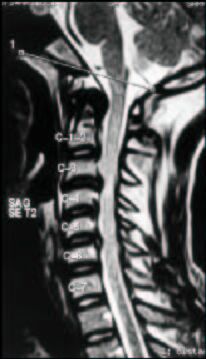 The vertebral artery groove in the superior facet of C2 and the groove over the posterior arch of the atlas were completely occupied by the vertebral artery only in six sides and in none respectively, suggesting the possibility of the dynamic nature of the relationship of the artery to the bone. CONCLUSIONS: The vertebral artery adopts a serpentine course in relationship to the C2 vertebra, making it susceptible to injury during the surgical procedures in the region. The multiple loops of the artery and a buffer space within the vertebral artery groove on the inferior surface of the superior facet of the C2 vertebra and over the posterior arch of atlas provide the artery an extra length and space, probably essential to avoid any stretch during neck movements. BACKGROUND: Neurocardiogenic syncope (NCS) is a common paroxysmal disorder that is often misdiagnosed as a seizure disorder. Head up tilt test (HUTT) has been used to confirm this diagnosis. There is no data available of its use in children / adolescents from India. AIM: To study the usefulness of the HUTT in children and adolescents with suspected NCS. SETTINGS AND DESIGN: This was a part retrospective and later prospective study set in a tertiary child neurology outpatient department (OPD). MATERIAL AND METHODS: Patients with a strong clinical suspicion of syncope were recruited for the study. Clinical and treatment details were either retrieved from the chart or prospectively recorded in later patients. The HUTT was then carried out at baseline and after provocation and the results correlated with the clinical diagnosis. Results: Eighteen children with a mean age of 10.8 years were studied. Eight had precipitating factors. Thirteen had premonitory symptoms. Pallor, temperature change, diaphoresis, headache, tonic / clonic movements, post-ictal confusion and peri-ictal headache were symptoms noticed. Sixteen had a positive HUTT. Seven were on long-term anti-epileptic drugs (AEDs). Two had epileptiform abnormalities on their electroencephalogram (EEG). CONCLUSION: The diagnosis of syncope is often confused with epilepsy. Head up tilt test has a high sensitivity in the diagnosis of NCS in children / adolescents. It is fairly safe and easy to perform. BACKGROUND AND AIMS: A prospective study was carried out to evaluate the lumboperitoneal shunt procedure. 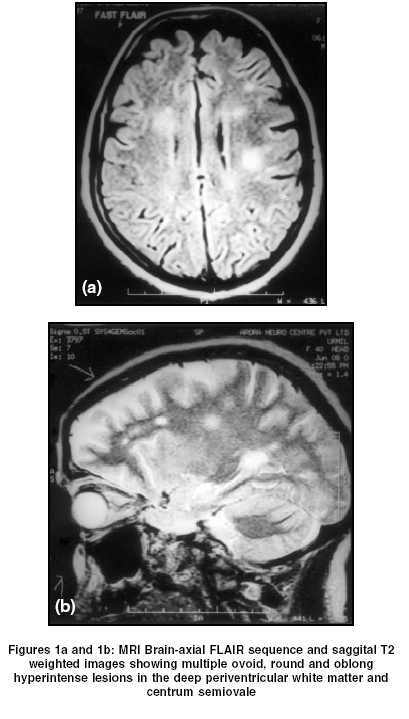 MATERIAL AND METHODS: Four hundred and nine patients having communicating hydrocephalus were selected for the procedure during a 10-year period from March 1992 to February 2002. The average follow-up was 45.34 months. RESULTS: Tubercular meningitis (TBM)-related hydrocephalus was detected in 285 patients. Forty per cent of the patients were less than 15 years of age. 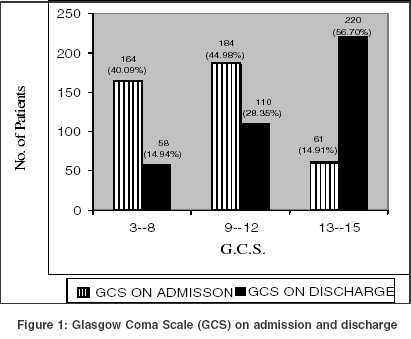 Glasgow Coma Scale (GCS) of less than 8 was seen in 40% patients and 14.9% patients were in GCS 13-15. At the time of discharge 56.7% patients improved in their GCS to 13 -15 and 14.9% were in GCS 8 or less. The overall mortality was 5.13% and shunt-related mortality was seen in 2% patients. Shunt malfunction requiring revision was seen in 32 patients (7.8%) and the total number of shunt revisions was 44 (11%). Shunt infection was noted in 3.4% patients. 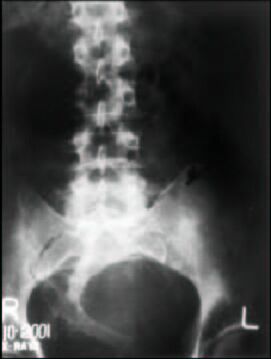 CSF leak at the lumbar end occurred in 12 patients. Four patients required conversion of LP shunt to VP shunt. CONCLUSIONS: Lumboperitoneal shunt is an effective shunting procedure in communicating hydrocephalus. BACKGROUND: In acute stroke, a number of drugs are used to reduce the raised intracranial pressure (ICP) although their scientific basis has not been established or shown in randomized controlled trials. 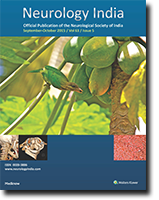 AIMS: In this communication, we report the pattern of use of antiedema therapy in acute stroke by general physicians (GPs) and neurophysicians (NPs) in India. MATERIAL AND METHODS: A questionnaire was developed regarding the use of various antiedema measures in stroke and responses were collected either through post or when the responders were attending a national conference. The use of antiedema therapy by NPs and GPs was analyzed employing the Chi-square test. RESULTS: We could collect responses from 102 physicians, of whom 48 were NPs and 54 GPs. More than two-thirds of the physicians managed more than three strokes per week and all used antiedema therapy at some time or the other. Thirteen used it in all the patients and the remaining used it in patients with large and moderate strokes or in patients with herniation. Twelve used only one drug, while the remaining physicians used various combinations in different doses and frequency. The prescribing pattern was significantly different between GPs and NPs with respect to the frequency of the antiedema drugs used, type of stroke where these were used, combination of drugs, timing and dose of mannitol. CONCLUSION: This study highlights that antiedema therapy in acute stroke is practiced without any uniformity. BACKGROUND AND AIMS: This study aims at evaluating the clinical and radiological outcome of tuberculous meningitis (TBM) patients with pulmonary miliary tuberculosis. MATERIAL AND METHODS: Diagnosis of TBM was based on clinical, CT scan or MRI and CSF criteria, and that of miliary tuberculosis on chest radiograph. Detailed clinical evaluation was done in all. 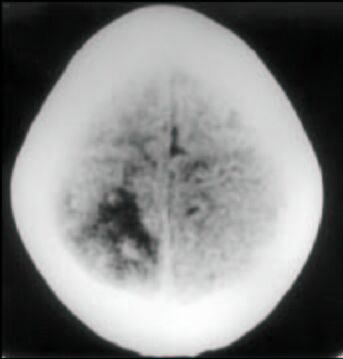 Severity of meningitis was graded into Grades I, II and III. Complete hemogram, serum chemistry and Montaux tests were performed. The recovery was defined on the basis of 6 months Barthel index score as poor, partial or complete. RESULTS: 20 out of 165 patients with TBM had pulmonary miliary tuberculosis. Their mean age was 30 years; there was one child and 13 patients were females. The mean duration of symptoms was 6.3 months. Montoux test was negative in 9 patients. Six patients were in stage I, 3 in stage II, and 11 in stage III meningitis. 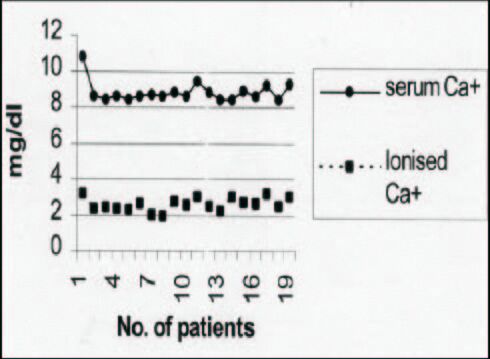 Hemoglobin was below 12 gm% in 13 and liver dysfunction and hypocalcaemia was present in 8 and 18 patients respectively. 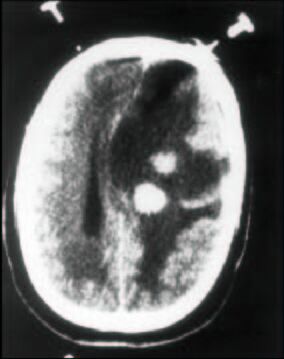 CT scan was abnormal in 16 patients and revealed hydrocephalus (10), granuloma (7), exudates (3) and infarction (1). MRI was abnormal in 7 out of 8 patients and 3 of these patients had normal CT scan. MRI revealed multiple granuloma in 7 patients and exudates in 2. At 6 months, 2 patients died, 10 had complete, 2 had partial and 4 had poor recovery. CONCLUSION: TBM with pulmonary miliary tuberculosis was commoner amongst females who were anemic and hypocalcaemic. 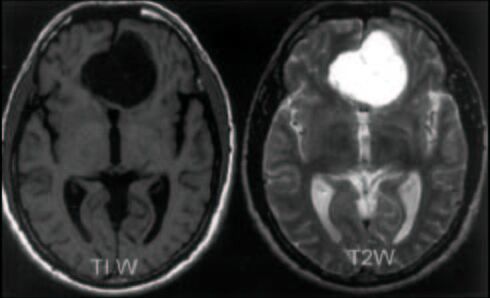 MRI revealed multiple granuloma and the majority of the patients improved. BACKGROUND: No Indian studies have focused on the clinical aspects of tremor. AIMS: To study the distribution of various etiological types of tremor disorders at a Movement Disorders clinic of a large, tertiary care hospital in India and to study the clinical characteristics of essential tremor [ET]. SETTING AND DESIGN: Prospective cross-sectional study at a tertiary care specialty clinic. MATERIAL AND METHODS: Patients presenting with tremor as the chief complaint, with no features suggestive of parkinsonism, cerebellar disorder or acute central nervous system disorder, were included. Patients were classified into different etiological categories from detailed history. All patients diagnosed as ET, were further interrogated for a detailed family history and examined for characteristics of tremor. These patients were then classified into 'definite', 'probable' and 'possible' ET. RESULTS: One hundred and six patients (mean age 44.4 + 15.1 years) were examined during the study period. ET (59.4%) and dystonic tremor (21.7%) were the commonest types. Only 43% patients of ET reported progression; response to alcohol was seen in only a single patient, a positive family history was present in 52.4% and in 36.4% the inheritance was of an autosomal dominant pattern. CONCLUSION: ET and dystonic tremor are the commonest causes of tremor presenting to a specialty Movement Disorders clinic. Most patients with ET have high-frequency tremor, with mild asymmetry in 40% cases. Alcohol responsiveness may not be a useful tool in the diagnosis of ET. Valley sign has been described in patients with Duchenne muscular dystrophy (DMD). As there are genetic and clinical similarities between DMD and Becker muscular dystrophy (BMD), this clinical sign is evaluated in this study in BMD and DMD/BMD outliers. To evaluate the sign, 28 patients with Becker muscular dystrophy (BMD), 8 DMD/BMD outliers and 44 age-matched male controls with other neuromuscular diseases were studied. The sign was examined after asking patients to abduct their arms to about 90ºwith hands directed upwards; the muscle bulk over the back of the shoulders was observed. The sign was considered positive if the infraspinatus and deltoid muscles were enlarged and between these two muscles, the muscles forming the posterior axillary fold were wasted as if there were a valley between the two mounts. Twenty-five BMD patients and 7 DMD/BMD outliers had positive valley sign. However, it was less remarkable in comparison to DMD. It was absent in all the 44 controls. It was concluded that the presence of valley sign may help in differentiating BMD from other progressive neuromuscular disorders of that age group. The study was based on the data of a sample of 400 epileptic patients (200 idiopathic and 200 symptomatic) and 100 normal healthy individuals serving as controls. 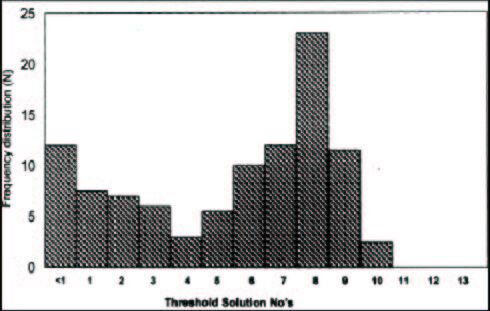 The PTC threshold distribution was bimodal. The number of non-tasters among idiopathic epileptics (35.5%) and symptomatic epileptics (32.5%) was significantly higher than controls (20%). 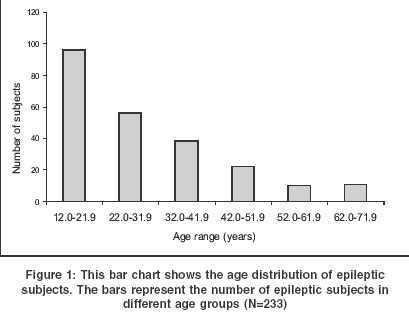 The relative incidence of non-tasters in idiopathic and symptomatic epilepsies was 2.20 and 1.93 respectively. There is evidence that non-tasters tend to ingest a greater quantity of bitter tasting goitrogenic substances present naturally in edible plants which in turn exert greater thyroid stress in non-tasters or less sensitive tasters. Such a stress during intrauterine or early childhood growth and development might have affected neurological maturation which in turn made them more susceptible to epilepsy than tasters, who faced lesser stress. Tuberous sclerosis (TS) is an autosomal dominant disease that affects the brain, skin, eye, heart and kidney. The diagnostic criteria for tuberous sclerosis complex (TSC) have recently been revised. There are relatively few Indian studies on this disorder. Twenty-six patients diagnosed as having TS over a period of 18 years are being reported. The onset of seizures ranged from infancy to adolescence. The patterns of epilepsy encountered were generalized tonic clonic seizures (13), complex partial seizures (10), simple partial seizures (9) and myoclonic jerks (4) including infantile spasms (3). 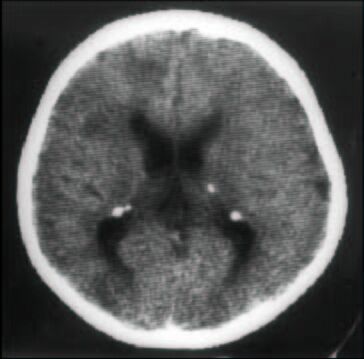 Patients often had more than one seizure type. Nineteen patients were mentally subnormal. Cutaneous manifestations were facial angiofibroma i.e. adenoma sebaceum (20), shagreen patches (7), hypopigmented macules (6), ash leaf spots (4), café-au-lait spots (2), facial hypoplasia (2) and periungual fibromas (1). One patient each had retinal phakoma and renal angiomyolipoma. 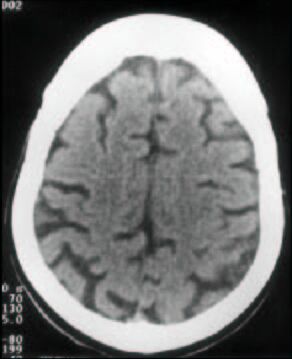 CT scan revealed sub-ependymal calcifications (12), parenchymal tubers (3), cerebral edema (3) and cortical atrophy (1). One patient had enhancement of peri-ventricular sub-ependymal lesions on MRI. Anticonvulsants prescribed were phenobarbitone (20), diphenyl hydantoin (14), carbamazepine (8), sodium valproate (4), benzodiazepines (4), ACTH (2), prednisone (1), mysoline (1) and vigabatrin (1). Most patients were on combinations of anti-convulsants and response to therapy was usually not very satisfactory. However, the child treated with vigabatrin did well. A study was designed to generate epidemiological and clinical data on dementia, in a teaching hospital in India. It was conducted on 124 (94 male and 30 female) elderly patients (aged more than 60 years) presenting with clinical syndrome of dementia (DSM-3). Their age range was 64-78 (mean 65.7 4.1) years. Detailed clinical, biochemical, radiological and electrophysiological evaluation was done to establish etiology. Patients with psychiatric ailments, cranial trauma and tumors were excluded. The study period was 4.2 years. Multi-infarct dementia (MID) was observed to be commonest cause of dementia and was present in 59 (47.6%) cases. There were 10 (8%) patients each of tuberculosis (TB) and neurocysticercosis (NCC). Alcohol-related dementia was present in 13 (10.5%), while malnutrition (Vitamin B12 deficiency) was present in 9 (7.2%). Alzheimer's Disease (AD) was present (NINCDS-ADRDA criteria) in 6 patients (4.8%). There were 3 (2.4%) cases 1 each of Huntington's disease, Parkinson's and Normal Pressure Hydrocephalus and 2 each of diabetes, hypothyroidism, hyperthyroidism and Creutzfeldt' Jakob Disease. We conclude that AD, which is irreversible and common in the west, is relatively uncommon in India as compared to MID, infections and malnutrition, which are potentially treatable. 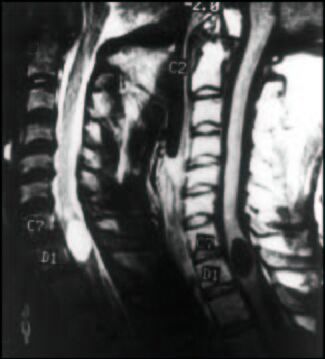 Cervical spondylotic myelopathy (CSM) is uncommon at the C3-4 level. Fourteen patients with C3-4 CSM were treated over a period of 3 years. The radiological factors contributing to CSM at the C3-4 level were studied. 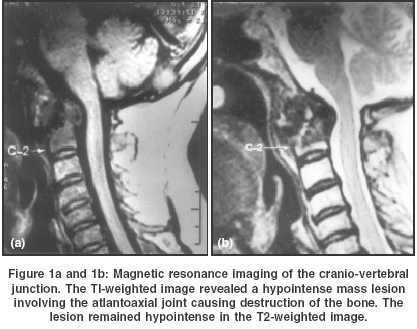 These factors included the assessment of static and dynamic canal diameters, retrolisthesis, posterior osteophytes and degenerative spinal segmental fusion on plain X-rays; and, the antero-posterior cord compression ratio (APCR) on magnetic resonance imaging (MRI). The clinical status of the patients was assessed by the modified Japanese orthopedic association scale (mJOAS). The mean difference between the static and dynamic canal diameters was statistically significant at C3-4 (p < 0.01). The APCR obtained at different levels showed a significant compression at the C3-4 level in comparison to the lower level. There was a correlation between the APCR and the preop mJOAS, r=0.6 (p<0.05). The mean mJOAS improved from 9.35 to 14.35 at follo-up. The recovery rate calculated using the modified Hirabayashi rate was 66.9%. Degenerative changes at lower cervical segments predispose to increased mobility and spondylotic changes at the C3-4 level. The patients in this study were young as compared to those reported in the international literature. OBJECTIVE: This prospective study was planned to study the prognostic value of routine clinical, hematological and biochemical parameters, including platelet aggregation in patients of acute stroke, on fatality occurring during the first 30 days. MATERIAL AND METHODS: In this study 116 consecutive patients (77 males and 39 females) of stroke (within 72 hours of onset) were included. After clinical evaluation and neuroimaging, blood investigations, hemoglobin, total leukocyte count, platelet count, platelet aggregation, erythrocyte sedimentation rate (ESR), blood sugar, urea, creatinine, sodium, potassium, serum cholesterol, serum bilirubin, aspartate aminotransferase (SGOT), alanine aminotransferase (SGPT), albumin, and globulin estimations were performed. The patients were followed up for a maximum period of 30 days from the onset of stroke, and patients who expired were grouped as 'expired' and the rest as 'survivors'. Logistic regression analysis was carried out among the significant parameters to identify independent predictors of 30-day fatality. RESULTS: Univariate analysis demonstrated that among hematological parameters, high total leukocyte count and ESR, at admission, correlated significantly with an undesirable outcome during the initial 30 days. Among biochemical parameters, elevated urea, creatinine, serum transaminases (SGOT and SGPT) and globulin levels correlated significantly with death. Logistic regression analysis demonstrated that a low Glasgow Coma Scale (GCS) score along with biochemical parameters such as high serum creatinine, SGPT, ESR and total leukocyte count correlated with death. CONCLUSION: Impaired consciousness, high total leukocyte count, raised ESR, elevated creatinine and SGPT levels, estimated within 24 hours of hospitalization, are the most important indicators of 30-day mortality in patients with first-time ischemic stroke. To evaluate the effect of monotherapy (phenytoin sodium (DPH) and carbamazepine (CBZ) on the threshold intensity (TI), cortical latency (CL), central conduction time (CCT), using transcranial magnetic stimulation (TMS). A single pulse transcranial magnetic stimulation was used for recording the motor-evoked potentials (MEP) from the thenar muscles of both hands, in 36 patients with well-controlled epilepsy on monotherapy, with normal EEG and imaging studies. The TI, CL, CCT and the MEP amplitude were recorded and compared with 20 healthy controls. The threshold intensity was significantly higher in patients on DPH, (P<0.05) with a significant decrease in the MEP amplitude when compared with controls (P<0.05). Anticonvulsants alter the excitability of human motor pathways in epileptic subjects. This effect differs among the drugs used; DPH had a greater depressant effect on the excitability than CBZ in the present study. BACKGROUND: p53 is a tumor suppressor gene implicated in the genesis of a variety of malignancies including brain tumors. Overexpression of the p53 protein is often used as a surrogate indicator of alterations in the p53 gene. AIMS: In this study, data is presented on p53 protein expression in adult cases (>15 years of age) of astrocytic (n=152) and oligodendroglial (n=28) tumors of all grades. Of the astrocytic tumors, 86% were supratentorial in location while remaining 14% were located infratentorially - 8 in the the cerebellum and 13 in the brainstem. All the oligodendrogliomas were supratentorial. MATERIALS AND METHODS: p53 protein expression was evaluated on formalin-fixed paraffin-embedded sections using streptavidin biotin immunoperoxidase technique after high temperature antigen retrieval. RESULTS: Overall 52% of supratentorial astrocytic tumors showed p53 immunopositivity with no correlation to the histological grade. 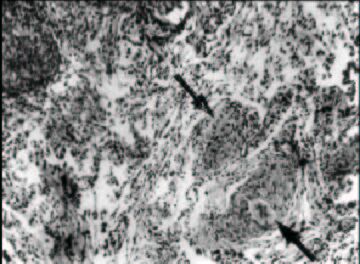 Thus, 58.8% of diffuse astrocytomas (WHO Grade II), 53.8% of anaplastic astrocytomas (WHO Grade III) and 50% of glioblastomas (WHO Grade IV) were p53 protein positive. In contrast, all the infratentorial tumors were p53 negative except for one brainstem glioblastoma. 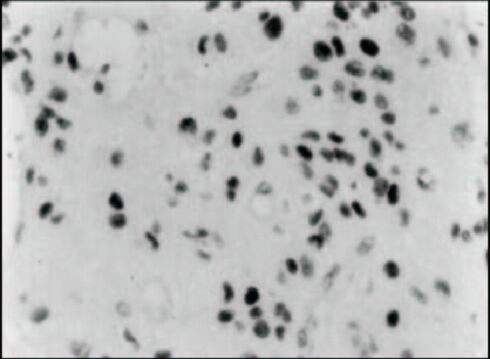 Similarly, pilocytic astrocytomas were uniformly p53 negative irrespective of the location. Among oligodendroglial tumors, the overall frequency of p53 immunopositivity was lower (only 28%), though a trend of positive correlation with the tumor grade was noted - 25% in Grade II and 31.5% in grade III (anaplastic oligodendroglioma). Interestingly, p53 labeling index (p53 LI) did not correlate with the histopathological grade in both astrocytic and oligodendroglial tumors. CONCLUSIONS: Thus, this study gives an insight into the genetic and hence biological heterogeneity of gliomas, not only between astrocytic tumors vs. oligodendrogliomas but also within astrocytic tumors with regard to their grade and location. With p53 gene therapy trials in progress, this will possibly have future therapeutic implications. The goal of antiepileptic drug (AED) therapy is to achieve a seizure-free state and eliminate the medical and psychosocial risks of recurrent seizures. Burden of epilepsy on the economy of a country may be largely due to the expenditure on AEDs. The adverse effects may influence the compliance to AEDs and effective control of epilepsy. We determined the pattern of AED use, the degree of epileptic control achieved and the adverse effects experienced by the epileptics in a Tertiary Teaching Hospital in Sri Lanka. Carbamazepine was found to be the most frequently used AED. Monotherapy was used on 70.8% of subjects. 86.27% of the study sample had achieved effective control of epilepsy with a 50% or more reduction in seizure frequency. Of them 72.64% were on monotherapy and they were either on carbamazepine, sodium valproate, phenytoin sodium or phenobarbitone. None of the new AEDs were prescribed to these patients. 50.9% on monotherapy and 51.5% on polytherapy reported adverse effects. Somnolence followed by headache was found to be the most frequently reported adverse effects by those on monotherapy and polytherapy both. This study shows that most epileptics can be effectively managed with the conventional AEDs with clinical monitoring. Moyamoya disease, Japanese for 'puff of smoke', is a rare disease that presents most commonly with recurrent TIAs (transient ischemic attacks) / stroke in childhood. Ischemic symptoms in patients with moyamoya disease are usually due to hemodynamically-mediated perfusion failure. Identification of abnormal tissue perfusion is an important aspect of the evaluation of these patients. We present the radiological features including the Magnetic Resonance (MR) Perfusion findings illustrating the hemodynamic changes of cerebral ischemia in a case of moyamoya disease. We report a rare case of localized amyloidoma of the craniovertebral junction causing severe myelopathy and respiratory distress and death. The clinical features and the natural history of this rare condition are discussed. 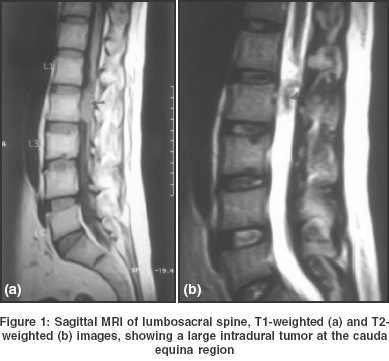 An unusual case of intradural paragangliomas in the cauda equina region in a 29-year-old male is presented. 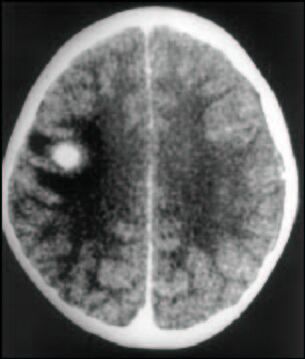 The patient presented with signs and symptoms of raised intracranial pressure. The symptoms resolved after tumor resection. 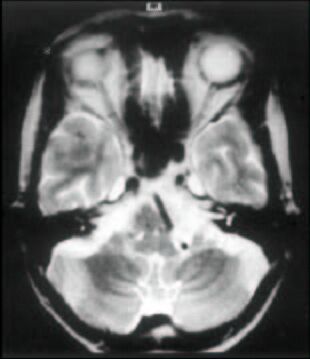 We report a case of 52-year-old female with steroid-unresponsive Hashimoto's encephalopathy. She underwent plasma exchange that resulted in marked clinical improvement. Subfrontal schwannoma not arising from the cranial nerves are rare tumors. A 19-year-old man presented with a large subfrontal extra-axial enhancing mass with a preoperative diagnosis of skull base meningioma. A subtotal resection of the tumor mass was carried out. Microscopic examination revealed it to be a schwannoma. The residual tumor was treated with fractionated three-dimensional conformal radiotherapy (3D CRT). The rationale of treating with radiotherapy in such cases is analyzed. 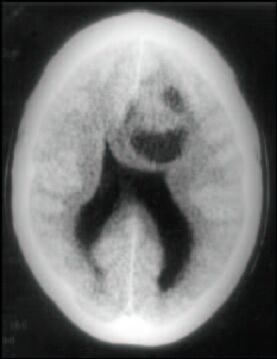 A case of pineal germinaoma spreading along the basal subarachnoid space, clinically and macroscopically at autopsy, resembling tuberculous basal arachnoiditis is reported. Need to carry out CSF cytology of even hemorrhagic CSF is stressed, to diagnose the condition. Congenital fiber type disproportion is a rare type of congenital myopathy which presents as hypotonia, delayed motor milestones and dysmorphic facies. During the past 2 years we received 449 muscle biopsies, of which 4 cases were diagnosed as congenital fiber type disproportion (CFTD). In addition to CFTD, one case also had centronuclear features. Three of them were females and one was a male child. 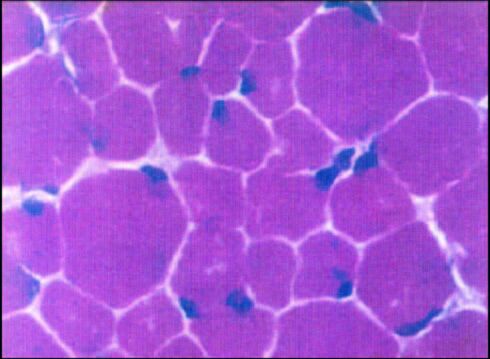 Although rare, it should be considered in the differential diagnosis of childhood muscle diseases. Histochemical staining is necessary for the diagnosis of this entity. A 28-year-old man presented with history of raised intracranial pressure and one episode of generalized tonic clonic seizures. 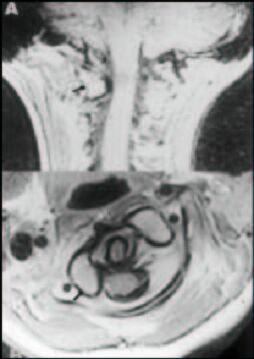 Computed Tomogram revealed multiple contrast enhancing intracranial lesions. Biopsy of one of the lesions was reported as metastatic alveolar soft part sarcoma. He was advised whole brain radiotherapy. We report a case of surgically proven giant neurocysticercosis (NCC). MR imaging revealed an unusually large solitary parenchymal cystic lesion showing signal intensity similar to CSF on all pulse sequences, with internal septations and a small nodule in the anterior aspect of this lesion compatible with this diagnosis. Identification of a scolex in a cystic lesion with CSF intensity plays a key role in the diagnosis of NCC. The presence of internal septations is an atypical feature. 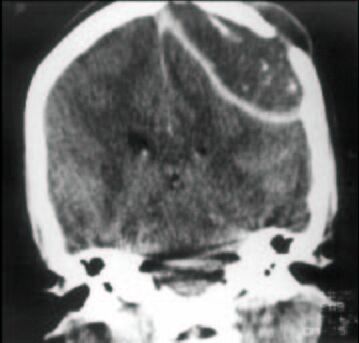 Intracranial schwannoma not related to cranial nerves are unusual and rarely found in the subfrontal region. We report a case of cystic olfactory groove schwannoma in a 55-year- old male, who presented with late onset seizure without raised intracranial pressure. The tumor was excised completely. We report two rare cases of primary intracranial plasma cell granuloma. The tumors probably arose from the dura and involved the cerebral parenchyma. These patients presented with clinical features of raised intracranial pressure and there was focal neurological deficit. The management issues are discussed. 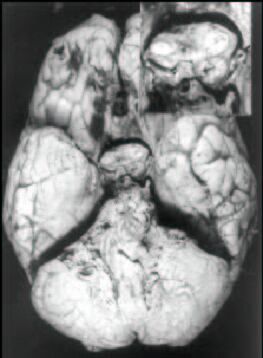 A 42-year-old soldier, a known case of cerebral parenchymal neurocysticercosis presented with insidious onset gradually progressive weakness of both lower limbs for six months. Investigations revealed an intramedullary cyst in the cervicodorsal region. Following surgical excision of an intramedullary cysticercus cyst, the patient showed recovery in his neurological deficits. 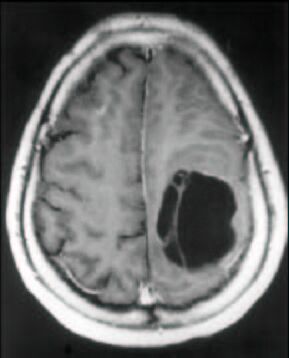 Recurrence of symptoms in a patient with a resolved solitary cerebral cysticercus granuloma (SCCG) is uncommon. Recurrent seizures in these patients are generally attributed to an epileptogenic scar or calcific residue of the granuloma. We report two patients with recurrent seizures and one patient with headache; all three patients were previously diagnosed to have SCCG and had complete resolution of the granuloma on follow-up imaging. 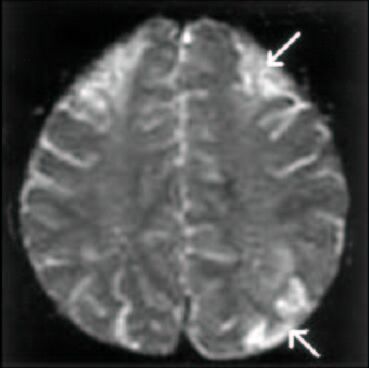 Computed tomography (CT) at the time of recurrent symptoms showed a SCCG at a site different from the initial lesion, but in the same cerebral hemisphere in all the three patients. Since a new lesion can cause recurrent symptoms in patients with a resolved SCCG, repeat imaging should be performed in all these patients. We also postulate that recurrent cysticercal lesions in patients who have previously had a SCCG, tend to be solitary. Fenofibrate induced myopathy is a rare adverse event. We present a case of muscle pain and quadriparesis following administration of 200mg of fenofibrate for 35 days. Patient gradually improved after stopping the drug. As per our knowledge, this is probably the first case report of fenofibrate induced myopathy from India.